In the previous post, I highlighted the importance of memorial plaques – often taken for granted and passed by – in reclaiming suppressed histories and reasserting identity. As an afterthought, I want to highlight one small way in which these struggles are still being reflected closer to home, in Nottingham – showing that the contentious nature of historical memories of the Spanish Civil War can still cause ripples in the political world. The International Brigades of the Spanish Civil War of 1936-1939 were those from around the world who, in the face of official “neutrality” from their national governments (or active hostility – many were German exiles), volunteered to fight against Franco’s fascists, and on the side of the elected Republican government. Almost all of them were ordinary working people, sometimes connected to the Communist Party, or with other connections to the Left, such as the Co-operative Movement. Their bravery and commitment to anti-fascist solidarity still resonates through our culture, from George Orwell’s Homage to Catalonia, his memoir of his time with the Trotskyist group the POUM, to Ken Loach’s 1995 film Land and Freedom, to Manic Street Preachers’ 1998 number one track If You Tolerate This, Then Your Children Will Be Next, inspired by the Welsh miners who signed up to fight (as the lyrics say, “If I can shoot rabbits, I can shoot fascists.” See Francis, 2012). However, with the death in 2016 of Stan Hilton, the last surviving British veteran of the International Brigades (in Australia, aged 98), the cultural memories, and physical memorials, of their service, become increasingly important – part of what Marianne Hirsch calls “post-memory” – ‘the relationship that the “generation after” bears to the personal, collective, and cultural trauma of those who came before’ (Hirsch, 2008), the effects of which are still being experienced in the present. 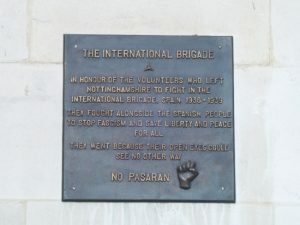 To the left of the main entrance to County Hall in Nottingham, and well worth a visit, is a memorial to the people of Nottinghamshire who volunteered to fight with the Brigades. ‘They went because their eyes could see no other way,’, it states. ‘NO PASARAN.’ In the centre is a sculpture by Doncaster artist Michael Johnson, showing the bomb destruction of a Spanish city. The memorial is marked by an information board, which records the historical purpose of the memorial, as living memories fade. 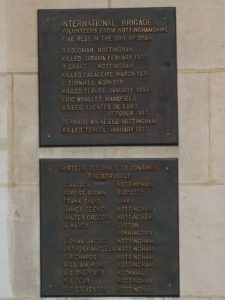 On the left, separate plaques record the names of five Nottingham volunteers who died in the conflict, and thirteen who returned home (although the exact figures are disputed – volunteering to fight was illegal and not all volunteers gave their real names). One of those who returned, Walter Gregory, published his memories of being an International Brigades volunteer in the book The Shallow Grave: A Memoir of the Spanish Civil War, dedicated to Bernard Winfield, one of the dead. Gregory, a shopworker from Bulwell, was wounded in three battles in Spain (The Independent quotes him as saying, of a bullet taken through the neck at the Battle of Ebro, “It wasn’t much, but by Jove it could have been serious”). A warm tribute to him was published on the Five Leaves Bookshop blog in 2013. 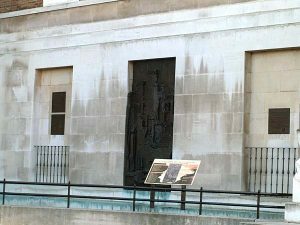 First unveiled on 24 September 1993 by Jack Jones (a trade unionist and himself a veteran of the International Brigades) and Ambassador Alberto Aza, the memorial did not immediately appear contentious – and there are many other such memorials throughout the UK. However, when the Conservative group was elected to overall control of Nottinghamshire in 2009, the information board for the monument was mysteriously removed. I have been able to find no inside information on this, and if anyone from the 2009 or present Council wants to contact me to explain why the board was removed, I’d be delighted to hear it. However, the reaction to this small act was telling. For some, this was a denigration of an important act of anti-fascist resistance, often seen as a precursor to World War 2, in which many of the International Brigades volunteers also served. Leader of the Labour group, Alan Rhodes, made a pledge to restore the information panel whenever Labour next controlled the authority. When Labour was returned to Council control in 2013, on of its first acts was therefore to restore the information panel. We swore in the valley of Jarama / That fascism never will reign. Students have raised the question in class of why this history is so little discussed, and there are a number of possible explanations. Are we perhaps uncomfortable with exploring Britain’s “non-alignment” in the Spanish Civil War, and the challenge laid down by our own citizens, who went to fight anyway? Is it guilt over complicity? Does it fit awkwardly with our national narrative of Britain as the plucky victors over fascism? Or are some just happy to bury this, and accept Franco’s assertion that history is written by the victors? The Republican government was, after all, defeated. The International Brigades were stood down in October 1938, in a doomed attempt to persuade the Italian and German fascist governments to also withdraw their active military support for Franco. But in suppressing these memories, however difficult, we remain haunted, as Jo Labanyi has argued in relation to Spain itself, by unfinished business. Hers is ‘a serious message about the need for a kind of modernity … that engages with the past’ (2007:101) if it is to avoid re-running the conflicts of the past. Although Conservatives (with Mansfield Independents) regained control of the council in 2017, the information board remains (for now?). 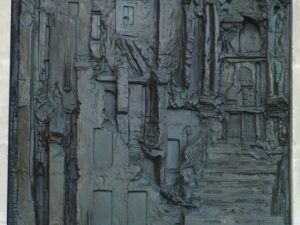 However, the response to its removal, and its reinstatement in 2013 with full ceremony, tells its own story – that in spite of, and perhaps because of, experiences passing out of living memory, history still matters; that bitter political conflicts resonate through time and across space; that battles over memory and identity are as current as they are historical, as international as they are national; and that the struggle for control over historical narratives can be seen even in something as apparently insignificant as an information board outside an East Midlands County Council hall. Salud! Beevor, Antony. (2006). The Battle for Spain: The Spanish Civil War 1936-1939. London: Weidenfeld & Nicolson. Francis, H. (2012) Miners Against Fascism: Wales and the Spanish Civil War. London: Lawrence & Wishart. Hirsch, M. (2008) The Generation of Postmemory. Poetics Today 29:1 (Spring 2008) 103-128. Jump, Jim (ed) (2006). Poets from Spain: British and Irish International Brigaders on the Spanish Civil War. London: Lawrence & Wishart. Labanyi, J. (2007) Memory and Modernity in Democratic Spain: The Difficulty of Coming to Terms with the Spanish Civil War, Poetics Today, 28:1, 89-113. Ryan, Frank (ed.) 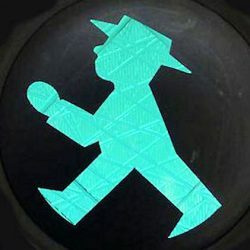 (1975). The Book of the XV International Brigade Madrid: Commissariat of War . Newcastle upon Tyne: Frank Graham (facsimile edition 1975). Walter Gregory (1986) The Shallow Grave: A Memoir of the Spanish Civil War. London: Victor Gollancz. NOTE: This blogpost was edited to remove an incorrect reference to Walter Gregory attending the rededication ceremony. Thanks to Five Leaves Bookshop for pointing it out. In the previous post, I reflected on the contested nature of historical memory, specifically when it comes to the Spanish Civil War and the prosecution of the crimes of the Francoist regime. This was brought into sharp focus by the experience of taking part in a Civil War tour in Barcelona while I was there for a conference in September 2017. I have sympathy for any student who is asked to sit through a lecture of more than 50 minutes, so if anyone had told me that I’d find a four hour historical tour around Barcelona as fascinating as I did, I’d have been amazed. That it was so gripping is partly down to the leader, Catherine Howley, a Trinity College graduate with a Master’s in Museum Studies from Pompeu Fabra University, and the way she brought history alive – but also down to physical scars born by Barcelona’s fabric, often so faded now that you needed someone there to point out their significance. Never have I been so aware of the meaning of Franco’s obsession with the idea that “history is written by the victors” – and the painstaking work which has gone into righting some of the false narratives propagated by his regime. I won’t try to cover the whole tour, but I’ll give just a couple of examples of the way the city has begun to bear witness to its own history. The first is the quiet Plaça of Santa Maria del Pi in the Gothic quarter of the city. 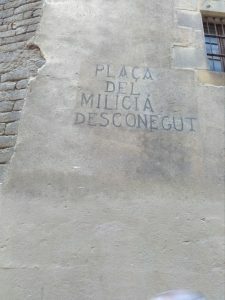 Some hand-drawn Catalan words are clearly visible on the side of the church here, naming it the Plaça del Milíciá Desconegut – the Square of the Unknown Militia – in remembrance of all those who had signed up to fight with the Republican militias, many of whom never came home. In spite of Barcelona’s role as one of the key Republican strongholds in the Spanish Civil War, this was one of the very few remaining physical manifestations of this history, barring a few bullet holes in the Placa de la Catalunya, the scene of fierce resistance fighting in the early days of Franco’s coup. 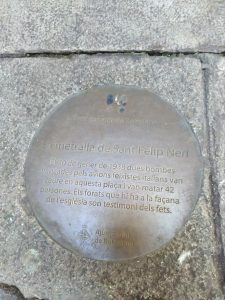 When Franco’s Nationalist army invaded the city in January 1939, all signs of Republicanism (and the anarchist/communist element which dominated Barcelona) were simply erased – just as the language they were written in was “erased” – and often replaced by names celebrating the fascist takeover. 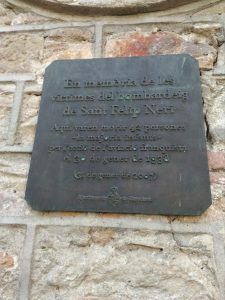 This particular inscription had survived the decades of Franco’s regime for one reason only: because no one knew it was there. The sign had been covered by boards – presumably by Republican hands – which saved it from destruction. 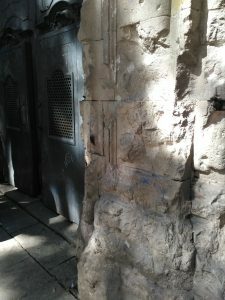 These remained there until 2004 when the Church was being renovated (you can see the marks of the boards on the photo). Those few words, then, written in tar, tell a story not just about the second Spanish Republic and its fate, but about the keeping of historical memory as a form of resistance, and its eventual reemergence into the light. The second example is the square in front of the church of Saint Felip Neri. The façade of the church is pock-marked with extensive damage to the stone, which bears obvious witness to violence. In Franco’s narrative, this is where the Republicans – the ‘red lowlife’ – lined up the Catholic priests and nuns who sided with the Nationalists, and summarily executed them. Catherine’s tour doesn’t shy away from the realities of civil war at this point, and it’s important not to romanticize the Republican resistance. Priests and nuns were executed as enemies of the Republic – but not here. Most of the executions took place in the hills of Montjuic, where about 4000 later victims of Franco’s ‘white terror’ were also dumped into the mass grave of El Fossar de la Pedrera (the Grave of the Quarry). What happened at Saint Felip Neri on the morning of 30 January 1938 was a different kind of execution – its obliteration by bombing by Italian aircraft sent by Mussolini in support of Franco’s offensive on the city. The square was targeted because there was a nearby school, and when the air raid warnings began, the children took refuge in the basement of the church. The first bombardment caused the floor to collapse onto them, crushing most. The Italian bombers then returned two and a half hours later, as the survivors were being pulled from the wreckage, and finished them off, in a move designed to cause maximum casualties (Mussolini’s own instructions were for ‘repeated attacks spread out over time’ – see Lo Cascio et al, 2013: 84-85). This testimony is important. A couple of plaques, a few words in tar on a wall, may not seem much, passed by citizens and tourists in their thousands, often unread and even sat upon by young visitors taking a break from sight-seeing or studying. In the context of the long struggle over historical memory, however, embodied in the Law of Historical Memory of 2007, and written in a long-suppressed language, it is an important witness to the past, and to the resurgence of democratic Spain. One that gives the survivors and victims – not the “victors” – the last word. Fraser, R. (1994) Blood of Spain: An Oral History of the Spanish Civil War. Pimlico. Lo Cascio, P. et al (eds) (2013) Soldiers, Bombs and Rifles: Military History of the 20th Century. Cambridge Scholars. Preston, P. (2013) The Spanish Holocaust. HarperPress. This is an act of cinematic reckoning for one of the crimes of this period of savage repression by the Franco regime: the Niños robados, or ‘stolen children’. As part of a ‘Politics of Revenge’ by the victors (Preston, 1995), approximately 30,000 children of killed or imprisoned Republicans were forcibly removed from their families, usually by doctors or Catholic priests and nuns, and adopted by Francoists, growing up with no knowledge of their past. This was part punishment and part ideological, a ‘cleansing’ of the newly fascist Spain from the ‘red lowlife’ (Preston) and their ‘Republican gene’ (see Ryan, 2017). It also allowed childless Francoist women to fulfil their destiny as ‘templo de la raza’ – to serve their husbands and reproduce for the nation, bringing up the next generation of good Catholics and fascists. The trafficking of children from families deemed to be politically ‘undesirable’, and later those deemed simply morally or economically deficient (single mothers or the poor), is now known to have continued throughout the Franco regime and well into the democratic period (El Salto, 2018), ending only in around 1990, and may have affected around 300,000 children and their families. The current trial of Dr Eduardo Vela in Madrid (El Pais, 2018), in case brought by Inés Madrigal, is notable however for being the very first prosecution to be successfully brought to court. The difficulties experienced in bringing these cases to justice shed light on the contentious nature of the recovery of historical memory in post-Franco Spain. Franco’s death on 20 November 1975 was the beginning of a process in which his proposed successor, King Juan Carlos, oversaw a successful transition to democracy, with the first democratic elections since 1936 being held on 15 June 1977. However, this also involved a process of deliberate ‘disremembering’ (Davis, 2005:864) and then ‘institutionalised amnesia’ (Davis, 2005:863). The Pacto del Olvido (Pact of Forgetting/Silence), passed in 1977 alongside an Amnesty law which gave Francoists immunity from prosecution (even for torture), was meant to safeguard the peaceful transition to democracy by preventing the past being used as a political weapon (as Franco’s own propaganda had). 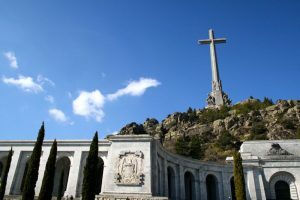 This meant that sites, objects and rituals related to Francoism were left untouched, including Franco’s own highly contested tomb at the Valle de los Caídos (Valley of the Fallen). Documentary evidence was destroyed or placed in closed archives. ‘A people cannot and must not lack historical memory’, El Pais reported, ‘but the latter must serve to encourage projects for peaceful future coexistence rather than promote rancour about the past’ (El País, 1977). There was a general reluctance to reopen old wounds, and by 1983, 73% of Spaniards saw Civil War as ‘a shameful period of Spanish history’ (Preston, 1995:39); the official narrative was one of shared responsibility – atrocities on both sides, best forgotten. By the end of the 20th century, however, this left Spain living haunted by unfinished business (Labanyi, 2007:113). 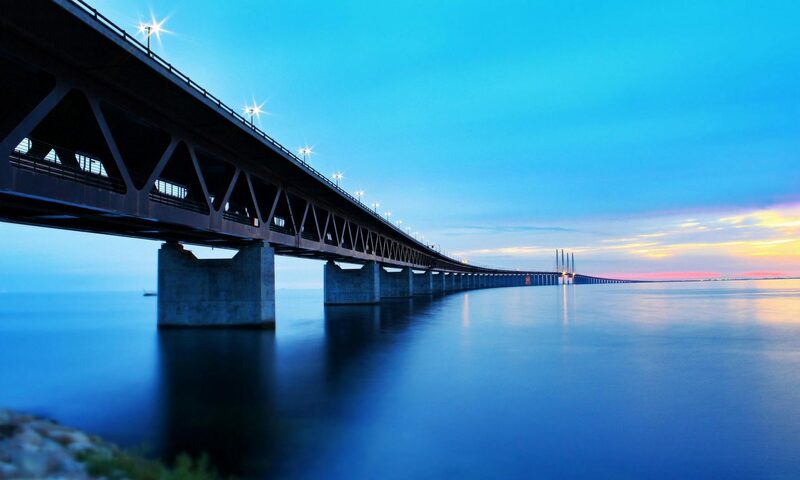 The need for truth and transitional justice – in parallels with democratization in Latin American nations such as Argentina, Chile – had never been addressed. The catalyst for change was in fact the indictment in October 1998 by Spanish magistrates of Augusto Pinochet, former Chilean dictator, for human rights abuses, leading to his arrest in London – a move widely supported by Spanish people as a way of achieving the justice for Chileans which they themselves had never received. In relation to Spain’s own history, demands for truth, if not justice, began modestly when Emilio Silva, a journalist, instigated a private exhumation in Priaranza del Bierzo in 2000, seeking the remains of his grandfather. However, the establishment of the Asociación para la Recuperación de la Memoria Histórica (ARMH, Association for the Recovery of Historical Memory) the same year, led to extensive media coverage and public debate – effectively, a “memory boom” (Labanyi, 2007:89). The election of the Socialist Party (PSOE) in 2004, under PM José Luis Rodríguez Zapatero, created the political space to escalate the process, resulting in the passing of the new Law of Historical Memory in 2007. This legalised the exhumation of bodies of those killed on the Republican side (mainly) from unmarked mass graves. However, it has also opened up a much wider debate over retroactive justice for crimes which have up to now been overlooked. Although the scandal of the niños robados had been known for some time (there were complaints of ‘irregular adoptions’ in the 1980s, and in 2006, the Council of Europe was the first international body to include the children in an official condemnation of Franco’s crimes – see Druliolle, 2018:81), the full scale of it only came to public attention in 2009. Two childhood friends from the Barcelona area, Antonio Barroso and Juan Luis Moreno, following a deathbed confession by Moreno’s father, discovered that they had both been “bought” from a Catholic priest in Zaragoza. After consulting an adoption lawyer and discovering that they were not alone, they went to the press, resulting in widespread media coverage (BBC, 2011). As the story unfolded, private disinterrals by parents who had been told their baby had died revealed empty graves, or adult remains. The 1977 Amnesty law has, however, made the investigation of child traffickers difficult to pursue. 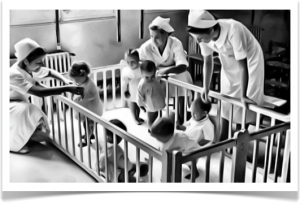 In addition, patriarchal Spanish laws, typical of the legacy of the Franco era, did not require the name of the biological mother on the birth certificate (According to the BBC, 70% of the births registered at Vela’s clinic in Madrid were recorded as ‘mother unknown’). In spite of around 2000 complaints being brought prior to the current case, therefore, the only action taken had been a questioning of Mariá Gómez Valbuena, a nun who had assisted Vela, but who died in 2013 before any case could be brought. The legal impasse began to be broken with the assistance of international human rights organisations; in this context, of particular importance has been the support of the Argentine activist group Asociación Civil Abuelas de Plaza de Mayo (The Grandmothers of the Plaza de Mayo), whose struggles to reunite stolen children with their parents had strong parallels with those of the Spanish children. In 2010, two descendants of Francoist victims, Dario Rivas and Inés García Holgado, brought a case before Judge María Servini de Cubría in Buenos Aries (see Ryan, 2017), based on the premise that the 1977 amnesty could not be applied to unresolved crimes which now fell under the domain of international human rights law. Although the judge found against the claim at that time, the popular support from both civil society groups and experienced human rights lawyers in Argentina gave the movement a new momentum. (Ryan, 2017). Madrigal, whose landmark case against Vela is now before the Madrid court, having discovered from her mother’s deathbed confession that she had been stolen for adoption, is now seeking her natural parents – a job made more difficult as Spanish law does not require DNA records to be held. This has begun to shift, with both the Partido Popular and Podemos parties agreeing in June 2017 to a budget for investigating genetic profiles, following a mission from the European Parliament. The Catholic Church also agreed to conditionally open its archives, although in January 2018, the Victimas de Bebes Robados de Espana were still demonstrating in Madrid to demand fuller access to records. However, this unburying of the past has to be seen in the context of a wider struggle over historical memory – at least among those who remember the Franco years. Although legal victories in the cases of the stolen children have been slow and incremental, their story is now part of Spain’s public discourse about its past. The Pedro Almodovar-backed documentary El silencio de los otros (The Silence of Others, 2018), sparked by the ongoing case against Franco’s crimes being heard in Argentina, marks another part of this attempt to break the silence around the victims, including the niños robados (The Guardian, 2018), and is currently showing both in Spain and on the international circuit. Whatever the outcome of the Vela case, this is part of a long and complex process in which the need for truth and justice, long postponed, is balanced with the dangers of stirring up ancient (and new) hatred. Even now, there is a danger that Franco himself dominates this story. In May 2017, Spanish MPs voted to have the dictator’s body removed from the Valle de los Caídos so that the site can be rededicated as a place of national reconciliation. ‘The wounds have been open for many years,’ new PSOE PM Pedro Sánchez told parliament in July 2018. ‘The time has come to close them.’ (The Guardian, 2018a). However, as the spectre of fascism rises again across Europe, this is being resisted both by Franco’s descendants, and by Far Right groups who now treat the site as a shrine to National Catholicism, although they deny it. ‘That’s leftwing manipulation of history,’ the dictator’s grandson, Francisco Franco Martínez-Bordiú is quoted in the same article. ‘There’s nothing to talk about.’ At the level of the state, then, this attempt to lay old ghosts to rest remains highly divisive. However, the campaigns for justice for the stolen children allow the victims, not the victors, to take control of the narrative, and are clear reminders that the private is also intensely political. At the level of the personal and familial, the niños robados, their natural parents and supporters show that there is still plenty to say about recovered memory, transitional justice, and the power of international solidarity for achieving it. Davis, M. (2005) Is Spain Recovering Its Memory? Breaking the “Pacto del Olvido“, Human Rights Quarterly, 27:3, 858-880. Druliolle, V. (2018) ‘The Struggle for Recognition of the Stolen Children and the Politics of Victimhood in Spain’, in V. Druliolle and R. Brett (Eds.) The Politics of Victimhood in Post-conflict Societies: Comparative and Analytical Perspectives, Palgrave, pp. 77-99. El Pais (1977), ‘Amnistía al fin’ (15/10/1977), p.6. Preston, P. (1995) The politics of revenge: fascism and the military in twentieth-century Spain. London; New York: Routledge, Chapter 2, pp. 29-45. Ryan, L. (2017) Memory, Transnational Justice, and Recession in Contemporary Spain. European Review, Vol. 25, No. 2, 295–306.